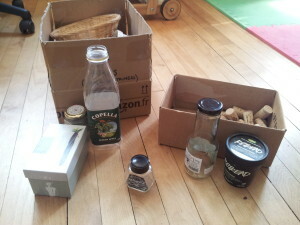 Even if you strive to minimise the amount of packaging and waste that comes into your house, there are always a few bits and pieces (cardboard, pots, jars…) that you end up throwing out. Meanwhile, the baby needs something to play with, and shop-bought toys are both expensive and using up even more resources. What’s an eco-conscious parent to do? Solve two problems at once, and divert some of that “rubbish” from the recycling bin to the toy box. Here are a few repurposed objects that have been a big hit with my one-year-old. Note: Always make sure items are thoroughly clean before you reuse them; and be aware of possible choking hazards with small objects. Make your own safety assessment of what you’re prepared to leave your child alone with, and if in doubt, stay close by. We go through lots of juice bottles with round plastic screw lids. Collect these for a few weeks. Then take a plastic lidded tub (I used a hummous tub), and carefully cut a slot in the top of it. The slot should just fit a juice bottle lid. Wrap the sharp edges of the slot with masking tape or electrical tape, and demonstrate it to your baby. Currently Leon is primarily interested in just taking the top off the container, dumping all the bottle-lids in, and dumping them out again to start over, but once he’s finished with that, the posting aspect will be waiting. Two toys for one! One of my partners is quite into French wine, so as a household we go through a certain number of corks. I started collecting them after reading a Teacher Tom post mentioning their preschool’s cork collection, and six or so months later, we have half a shoebox full. Leon absolutely loves them. They’re a great size for baby fists, and they fit neatly into the top of a plastic bottle (or a jam-jar, or nearly anything, in fact). If you like this idea and don’t have your own corks, try friends or a local restaurant. (And other containers.) Nearly any container is fascinating for kids of this age. Collect up clean jars with screw lids, pots with push or snap lids, old cosmetic pots, plastic bottles of different sizes, and anything else safe that you happen to have around. 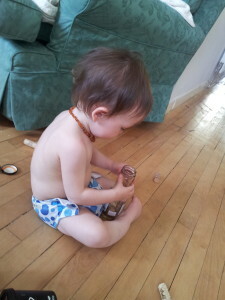 Leon is particularly keen on screw-top jars and will patiently sit screwing the lids off and on again for hours. Different size containers also means experimentation to find which ones fit into each other. This goes well with the cork collection, the bottle-tops, or any other small toy that comes to hand. Treasure baskets are very popular for babies and toddlers. You can buy things for this (we did in the end buy a few bits and pieces to add for his birthday), but ours started off just as a collection of interesting shapes and textures from around the house and garden. We initially kept it in a shoebox, although my mother gave us a nicer basket after seeing Leon playing with our collection. Items currently in ours include: a small flag I found in my memory box; a plug; half a wooden spoon; an ornate absinthe spoon (!! a never-used housewarming present that has lurked in the kitchen drawer for about a decade. It has a really interesting shape and texture, and it’s one of Leon’s favourite things to carry around); some crinkly cellophane; a hose/tap adapter; a bag of lavender; a magnetic compass; some empty thread spools; clothes pegs; some ribbons; some scraps of material; a metal egg cup; a piece of driftwood from the Thames foreshore (thoroughly cleaned! ); some stones ditto. And finally, that old toddler standby: a big cardboard box with some doors and windows cut in it. Leon loved ours at about 6-9 months, as he was getting good at crawling, but it has fallen out of favour a little right now. I’m about to put some thought into re-energising it, perhaps by hanging some fabric scraps in it to make it a more sensory experience. Any other suggestions for homemade toys from scrap materials? Please share them in the comments! Ooh, that’s awesome — thank you! We have a big cardboard box den atm but it’s pretty basic. I am quite taken by the train there! Great ideas! My kids like creating their own games and toy out of old stuff at home and already know what recycling is. Here are great new ideas for new recycling projects. Thanks!